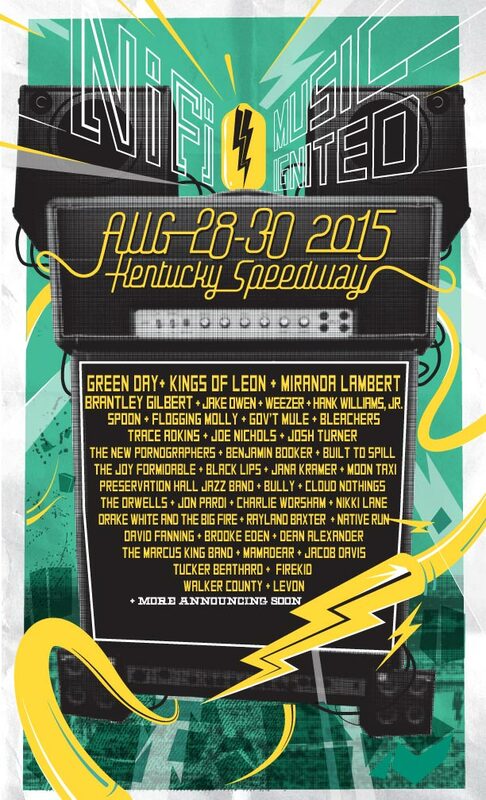 NiFi is a new camping festival set to take place in August at the Kentucky Speedway. It’s probably the only place this summer where you’ll be able to see both Cloud Nothings and Miranda Lambert. The inaugural lineup is a mishmash of alt-rock and country, meaning Green Day and Kings of Leon are listed as headliners alongside Lambert and Brantley Gilbert. It gets even weirder further down the bill, as Weezer, Spoon, The New Pornographers, Built to Spill, Black Lips, and The Orwells are presented in the same breath as Hank Williams Jr., Jake Owen, and Trace Adkins. Country is considered on of the most lucrative genres in the music industry, but its talent is not widely represented in most major festival lineups. Orlando Calling is perhaps the biggest example of a festival that attempted to present a lineup featuring both rock and country — only to find itself out of business the following year. Tickets to the event, including a $30,000 option called the Headliner Pass, go on sale beginning Thursday, May 28th. See the full lineup at Festival Outlook and the official poster below.